Here’s another version of my Beef Lumpiang Shanghai. I would say a much better version with a twist. Well, I actually forgot to ask my husband to defrost my ground beef and since we don’t have our microwave at the moment (yeah, we are in a process of moving-out from our old flat to our new crib), I have to make a trick to finish my cooking in-time for dinner. I boiled the ground beef with a pinch of salt for about 10 minutes in a medium high fire. When the meat turns lightly brown and has the right texture for my lumpia, I drained it and did the rest of the procedure. Since the meat is almost cooked I thought of mixing a cup of grated cheese to make it special. Parboil the ground beef with a 1/2 teaspoon of salt for about 10 minutes or until beef is ligthly brown.Drain and put in a bowl. Mix all the rest of ingredients in a bowl with beef except for the wrappers and oil. You can do a sampling at this point by taking a bit of the mixture and forming it into a small patty and frying it in oil. Just to test if it needs adjustment in seasoning. Lay your wrapper in a plate. Take about a tablespoon of the filling and lay on top near the bottom end of the wrapper. Form into a log shape as big as your finger. Fold the bottom end over slightly tugging the filling down so it would be wrapped tightly. Fold the sides toward the middle. Start rolling up. 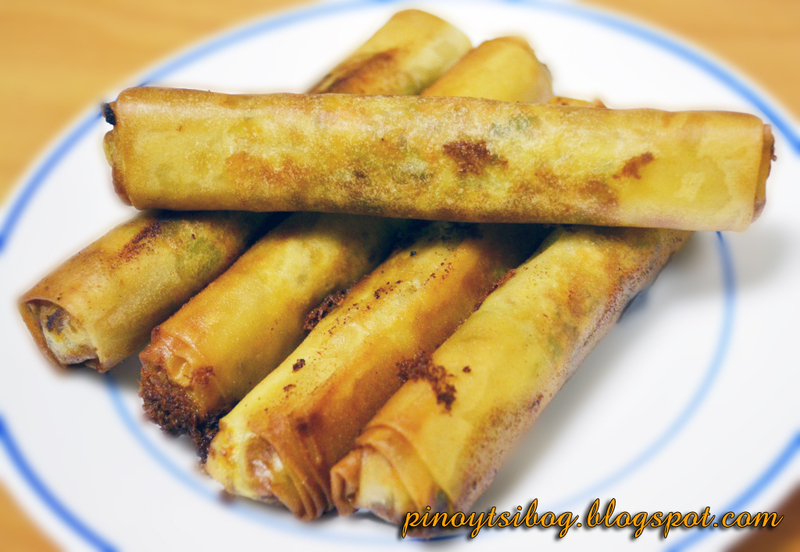 Brush the top end of your wrapper with a little bit of water or egg whites to seal the lumpia. When all wrapped up, heat oil in a pan and deep fry your lumpia for about 5 to 7 minutes in a low heat fire or until golden brown. Pull out and let excess oil drip over a strainer or paper towel. What kind of grated cheese do you recommend? Thanks. Hello :) Parmesan cheese would be great!